Even the most advanced label printing equipment is only as effective as the technicians who operate it. At Focus Labels, we therefore place great emphasis on high-quality, comprehensive training as part of our design and manufacturing service. 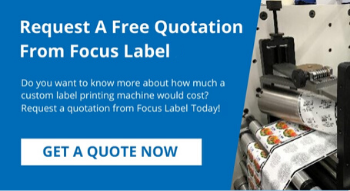 When you invest in new label printing equipment from Focus Labels, we will install your equipment at your location and provide full training for your team. We are in a unique position to show our customers the most effective way to get the most out of their equipment. This is because we undertake the entire design, manufacture and assembly process in-house, at our workshop near Nottingham. Therefore, the technicians and engineers who have worked on your project – from the very first consultancy stage up to its installation – will be the same people who train your team in its use. No part of our process is outsourced, so the training you receive will be from professionals who have a close working knowledge of your new print equipment. Our workshop and headquarters have a fully equipped showroom featuring all our latest models. Every one of our customers has free access to this showroom, where your team can familiarise themselves with operational examples of our print technologies. We have found that this drastically reduces your learning curve, as your staff will already be familiar with their new equipment before it is installed. Our team are on hand to supervise, to take questions and to demonstrate the practical uses of each piece of equipment. If you are in the market for new print equipment, you can request a demo of any of our machines by contacting our team to arrange a suitable appointment. We are passionate about our work and look forward to welcoming you to our production workshop for a free tour and demonstration. When your own print machinery is reaching the end of its construction phase, we will invite you to schedule a full training session that covers the workings and operation of your system. We can accommodate your team in our comfortable training facility, where our experienced staff will guide you through all you need to know to get the best value out of your equipment. If it is more convenient for you, we can conduct training at your location. Send us a message or contact us by phone to discuss your requirements and schedule a suitable time for your training session. For a realistic and affordable quote on some of the best print equipment available in the industry, please let us know a little bit about your budget and requirements, and one of our team will be in touch shortly with a bespoke quote.